The first step that we do is of course, to decide on the destination. For the Cuba trip, for example, we were in a bookshop in Kuala Lumpur with our friend Fay, and there we came across with a guidebook for Cuba. Indi flicked the book and saw the beautiful photos of the Carribean blue seas, and we instantly knew what we were thinking. I instantly respond to Indi, "Let's do it before Fidel dies!". This was, six months before the actual trip began. The second step is to roughly determine the dates and the duration of the trip of the destination. This happened immediately when we arrive home from that Kuala Lumpur decision. The dates were determined roughly based on the annual leave that we have. 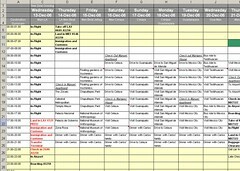 We built a basic spreadsheet with the number of days, and determined the dates which we need to travel by air (because this means the day is dedicated for major packing and unpacking). It looks like this, roughly. Then we began our research... to the library! And to Google! We are very grateful of Singapore's great National Library system and Singapore's speedy internet access. We got ourselves the newest version of the guidebook and dissect it. First thing to research: Airfares and its schedule. This involves calling and emailing travel agents all over the world for quotation, and sometimes, when no penalty is involved, by doing reservation. Tim Ferriss actually recommends using last minute deals to save cost, but since we travel in a big group, we're not so sure about this. Anyway, for our Mex-Cuba trip, we managed to get a pretty good deal by involving three different agents: The singapore agent to issue Singapore-LA tickets, Alaskan Airlines website for LA-Mexico ticket, and Mexican Airlines office for Mexico City-Cancun-Havana-Mexico City route. We're glad that the schedules of the different flights fitted nicely, with about 8 hours gap between flights, allowing time for delays and rest. Second thing to research: Visa: Its validity, cost, and application time. This involves calling the embassies. For US and Mexican Visas, there wasn't a real problem. It's a bit tricky because Cuban embassy is not available in Singapore. The closest one is actually in KL, but they don't serve Singapore residents. We had to do it in Jakarta, and with some persuasion, we managed to get them issued in one day. Third thing to research: Travel insurance. We chose AXA as it is the most economical. To compile the research data, we use spreadsheet again, that roughly looks like this. We marked the best deals in distinct red color. Our rough schedule became more solid now that we have clearer data on arrival and departure by air. For the details of the trip, we began to use the guidebook to research the accommodation options. We wanted a cheap, clean, and safe accommodation. If there is an option to stay with the locals and experience local culture, that would be even better. We also explored the option of hospitality club. The second thing of this stage is to identify what we want to visit in our destinations. We also used the guidebooks, and we try our best to check the vehicle and distance required to travel between the objects that we want to visit. If necessary, we even use google earth and roughly measure the distance. The approximate travel time is plotted down into a detailed itinerary spreadsheet, which uses hourly grid. This doesn't mean that we plan our activities to the hour detail level. This hourly spreadsheet only helps us to put down the land-travel time, so we roughly know how much free time we have, and when we should be prepare to leave for our next destination by land. 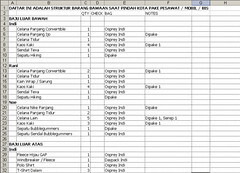 Later, we print this hourly spreadsheet, and on the road, we fill out the gap with the activities that we plan to do on the day. Once we have this spreadsheet, we were also able to jot down daily budget and then approximate the final budget for the trip. After this second level of planning, we began our bookings for the air tickets, hotel, and land transport. 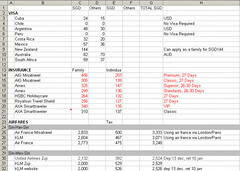 Finally, we again reviewed and adjusted the spreadsheets that we have done based on the finalised bookings that we had. We had clearer pictures of the day-to-day travel time vs free time. Then, we began to build logistics spreadsheet. This involves the list of things we bring and where (which bag) we keep them. Why is this list necessary? Firstly, so that we could travel as lightly as possible and as comfortable and safe as possible. Secondly, so that we know where to put things again, when we need to pack to move to the next destination, and also, so that we know where to locate our stuff without having to unpack the whole bag. During the trip, we need the discipline to store things at the correct bag. We also have list of possible souvenirs to bring home. Then we build a contact list that includes personal contacts in our destination, as well as emergency contacts (police, ambulance, and embassy). Lastly, we build a spreadsheet for the money that we bring: how much in travellers checks, how much in credit card pre-payment, how much in cash (EUR or USD), and how much we expect to withdraw from ATM. Well, we don't always do this list. But because we travel to Cuba, where money situation is a bit tricky, we need it. Print one copy of personal documents necessary for travel, such as medical conditions, insurance documents, etc. There you go. Many people said our trip planning and preparation looks like battle plan. Is it true? During the trip itself, we largely follow the plan. However we were quite flexible with itinerary. For example, we needed to cancel our plan to the smaller towns in Cuba because Noe was sick with viral infection. But that's OK, we're glad that our planning and preparation has resulted in a pleasant and memorable trip overall! Well, I usually planned my travel in a global scale. Meaning, I made a list of basic necessity but never drilled down to detail. Unless it was a very short trip/holiday with limited amount of time (like 2-3 days). The risk was obvious; missing objectives, could not find a place to sleep, late on catching transportation schedule and lots more. But the fun part was it always something came up as a surprising adventure and I found something that I probably never plan or even think of before. For me, that was worth more than anything. it's probably easier to "travel on a whim" or less planning when you don't travel with kids. i don't usually plan as detailed is this, although i do make gant charts to plot down time and places whenever i travel. it's easier to see what's coming and manage the time/money. 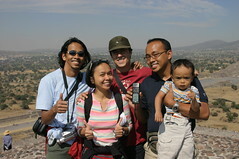 but maybe, next time we travel, we have to have a more detailed plan since now we have a kid tagging along with us. one thing i need to do next time we travel: insurance. so, AXA is good, eh? I must say, that this is the most immaculate travel plan i have ever seen. I also do travel planning like this, but this one has given alot of inspiration to me. Planning immaculately always helps, and within this kind of detail is very nice too. I am suggesting one thing, do put your travel plans on the internet after your trip, or while your trip in ongoing, you wd find alot of friends on the way, and also it helps other people who might want to travel to the same venue. Awesome work, i must say. It is always far better to plan anything in advance if poosible , peace of mind!!. to travel around the world is also my dream. That's why I've been working a lot and saving a lot of money to fulfill that dream.